Here we look at the basic elements of a CCTV system. What the individual components do and what you will need for a complete system. 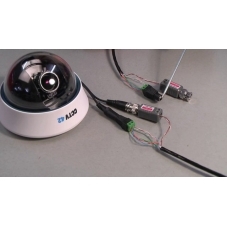 We also look at the differnent way you can connect CCTV cameras to the DVR recorder. We have a specific video covering the use of CAT5 cable to connect CCTV cameras to a DVR. This is a popular method and a good way of future proofing your installation. It is easy to do and requires no specialist tools. Our video baluns mean there are no awkward connectors to assemble. We also try to help you avoid buying the wrong equipment. This isn't always easy because companies make some very exaggerated claims for their products. Our noble leader even gets naked to prove the point ! What to expect when you unpack your DVR. We go through the various components which come with the DVR and talk you through the connections on the rear of the unit. Finally we guide you through the initial steps of powering on the machine and logging in for the first time. CAT5 cable is a popular choice when connecting cameras to a DVR recorder. CAT5 can be used to provide 12 volt power to the camera as well as transfer the video signal back from the camera to the DVR. We guide you through the use of video baluns and our screw in DC power connectors. No special tools are required, just a small screwdriver. Caught Naked on CCTV - CCTV42! Not for the fainthearted ! Our noble leader bares all to demonstrate that those Swann, Maplins, Costco, Screwfix and ebay cameras don't quite live up to the promises of their promotional material.